eBay Fees Calculator: Salecalc.com — One of the Very Best! I’ve been calculating fees on eBay for a long time now, slowly watching them climb from “high” to what I now think is ridiculous. Believe it or not, eBay was once a very, very cheap place to sell your goods. Now? Well– not so much. You have to have an extremely low cost on your products to make any money. Regardless, good eBayers have always known exactly what to charge and what their profits would be using an eBay fees calculator. That’s right– no guesswork at all! Smart entrepreneurs are always making sure they are making money before they ever source a particular product or list it on eBay. And, no– you don’t need to be some great math wiz (and I most certainly am not!). 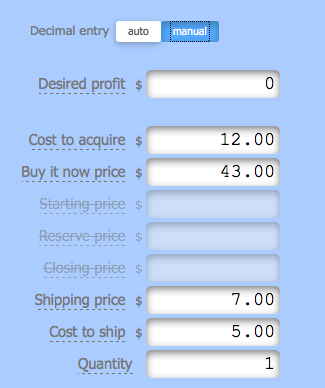 I always recommend you use an eBay fees calculator, much like the one at Salecalc.com. With a little effort, you’ll be able to use this calculator to quickly and efficiently calculate your eBay fees for any item, indicating to you such things as your total return, break-even selling price, Paypal fees, eBay insertion fees, listing upgrades, TRS discounts, and final value fees. It takes everything into consideration, assuming you provide it with the correct inputs. Using the calculator is simple but takes some practice. And– I always recommend that you understand the intuition behind the calculator anyway, so please read the following article about how eBay fees are actually calculated: Fees for Selling on eBay. I cannot emphasize this enough! Whether you are new to eBay 0r a seasoned seller, it’s always worth a review! Why would this be important, you ask? Again– if you understand the intuition behind the fees, this one is a no-brainer! An “Auction-Style” listing is much different than a “Fixed-price” or “Buy it Now” listing on eBay in terms of the fees paid. 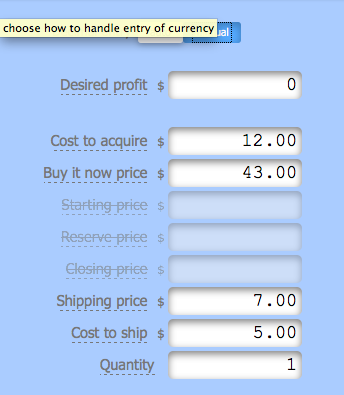 So the calculator asks you to indicate if you’re auctioning your item or selling it at a fixed cost. Make the selection and move on! eBay charges you various final value fees based on which category you select here, so make sure you’re choosing the right one! Electronics is the lowest at 7% starting, whereas category 3 (Books, DVDs & Movies, Music, and Video Games) is the most expensive at 13% starting. So please, please take just a second and think about what you’re selling! Choosing the right category can make the difference from being profitable or not! Also– if you have an eBay store, you generally receive various discounts on your insertion fees, so make sure you select the appropriate store type, if applicable. This is probably the most important part of the process. First, choose your “Cost to acquire,” meaning whatever it costs you total (may include sales tax if you’re buying the item first!). Here’s the rule of thumb– just calculate exactly how much your product cost you to have it at your doorstep ready to ship out. Oh– quick note… you don’t need to put in “Desired profit.” That’s optional. I never do it… You need the Buy it Now price, which is required if you’re doing a “Fixed-price” listing. BUT– if you’re doing an auction listing, the starting price, closing price, etc… are all critical. That’s why I really think you need to review the current eBay fee structure before seriously using the calculator. Again, without the intuition, using an eBay fee calculator can be difficult! Also, the shipping price is what YOU are charging and the shipping cost is what it will cost you to make it happen. What about free shipping, you ask? Just put a zero in the shipping price box, indicating that you are not going to be charging for shipping to your customer. eBay will nickel and dime you to death if you’re not careful! When you list using a “bold” title or place a “subtitle” on your listing, eBay will charge more. Here’s where to calculate it! Also– there are certain payment discounts reserved for Top-rated sellers, so if you qualify, make sure you select the option. Step 5: View the graph! The graph will help you visualize your inputs. After the calculator does the math, it spits out how much money you’ll get, total costs, net profit, and your rate of return on your money. Your net profit is your most important indicator here. Notice how the graph spits out ALL your fees! You now can see exactly how eBay is taking via the insertion fee and final value fee. Also– Paypal takes its cut too, and that is indicated here on the graph. 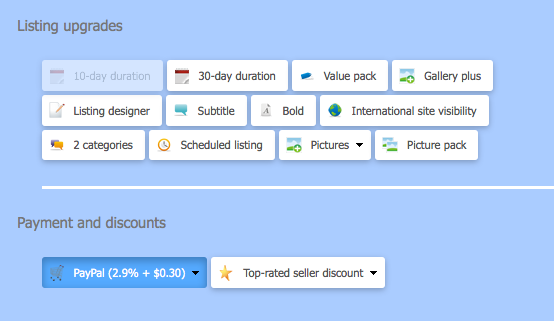 You’ll notice your percentage at the top as well, providing you with a visual of how much TOTAL is being taken from your sale. I hope this was helpful! The eBay fees can be complicated and confusing, especially to new sellers. Use this as a tool but not before you learn them without the calculator. An eBay fee calculator is only recommended after you have mastered the raw data and intuition behind why eBay and Paypal take what they take. Please– if you have any feedback, comment below. We appreciate your comments. Do you have another eBay fee calculator that you like more? If so, what is it and why? 17 Responses to eBay Fees Calculator: Salecalc.com — One of the Very Best! Thank you for the information, Trevor. I have calculated most of my eBay sales by hand or sometimes even just guessed! I can see why it might be helpful to actually know, especially for those of you starting businesses. Thanks Jan! It’s critical to know and understand your eBay fees! That explains it in a nutshell and my apprehension has been relieved. Thanks for the info. Just a typo I think: Under step 6 it says “…eBay takes its cut too…” I think you meant to say “PayPal takes its cut too…” Thank you so much for this tutorial. It is very helpful. Got it, Wendy! You’re exactly right. I made the change. I (Alice) am brand new to ebay. This information is very benefcial to me. Bob already has been using ebay, but also found the fee calculator helpful and fun to use. Glad this was helpful! I find that the eBay fees can be very confusing without a calculator — big time saver! One question: Is this in any way downloadable to an excel spreadsheet? You know… I don’t think it is downloadable to a spreadsheet, Jaye. You must be an Excel person, right? I’m sure you could probably make one pretty easily; in fact, Google “Excel ebay Fees” and I’m sure you’ll find something (maybe not as good), but still… Thanks for dropping by! I wish I had this tool a long time ago! But then again I get to work with you directly so I feel pretty lucky that way!! Your credibility stock just went up 25%!! You are the man!! Thanks Mark! It’s am amazing tool. Glad you find it useful. You created this program, Trevor? I did not. I wish! But it’s the best program out there for calculating fees, so I recommend it to everybody, even though I have no incentive to do it, other than to tell my clients what is best to use. What is the difference between an insertion fee and standard. Which should I choose? I am new to eBay and this tool is very helpful to me. I didn’t know that eBay and Paypal will take cut. Oh yeah – ebay actually owns Paypal, and they make a lot of money on that portion of their business. Recently there have been some ebay fee updates, so Paypal is always going to take about 3% and ebay is going to take about 10%; so plan on 13% going right out the door when you make a sale on ebay. It’s not bad… considering ebay finds you the customers. It’s almost like you are paying 10% to ebay for their marketing, and 3% to Paypal for their merchanting.